BACKGROUND: There is a perception among general surgeons that there are deficiencies in surgical training in South Africa (SA). Dependence on under-resourced state training institutions possibly plays a role. The opinions of qualified surgeons may make an invaluable contribution in this regard. OBJECTIVES: To canvass the perceptions of SA general surgeons regarding certain aspects of their training. METHODS: An electronic postal survey was conducted. All general surgeons on the Association of Surgeons of South Africa database were requested to complete a structured questionnaire. Four Likert scale items were interrogated: knowledge acquisition, surgical skill, research, and practice management. RESULTS: Eighty-eight surgeons responded. Knowledge acquisition and surgical skills development were regarded positively, except for a perceived deficiency in availability of newer technologies. Exposure to surgical research was viewed as beneficial and useful. However, the mandatory research project during training was not perceived as useful for current careers. Training in practice management was perceived as severely deficient. CONCLUSION: This survey highlights positive perceptions of general surgeons regarding the acquisition of knowledge and surgical skills during training in SA, but some negative views emerged regarding research, exposure to newer technology, and especially practice management training. An ever-growing responsibility is placed on training institutions in South Africa (SA) to continue high standards of medical education. The change in the SA government's health policies has resulted in more funding being channelled to primary healthcare, and therefore away from tertiary training centres. Because of the spiralling costs of new technology and pharmaceuticals there is less exposure of trainees to state-of-the-art medical practice. There is also a reduction of exposure to clinical material because of restrictions on patient care in tertiary institutions. There is a perception among general surgeons that there are deficiencies in the training in SA. It may be necessary to adapt postgraduate curricula to maintain standards. Qualified surgeons of all eras may be able to make an invaluable contribution in this regard. To canvass the opinions of general surgeons regarding their perception of postgraduate training in SA. A secondary aim was to possibly discern aspects of training that could be improved, with a view to making recommendations. An electronic postal survey was conducted via e-mail. All the general surgeons on the Association of Surgeons of South Africa (ASSA) database were sent an e-mail explaining the study and giving electronic access to a questionnaire. The questionnaire contained questions on basic demographics as well as aspects regarding the respondent's perception of his/her postgraduate training. The questions addressed theory/academic teaching, surgical technique, research and training for independent practice. Questions were to be answered on a four-point Likert scale, whereby respondents graded aspects of their training from 1 (very positive perceptions regarding quality or quantity, depending on the type of question) to 4 (very negative perceptions). This construction was used to avoid central tendency bias. Table 1 depicts the areas of training and the aspects of each that were interrogated. An example of one of the items in the questionnaire and the accompanying Likert scales is depicted in Fig. 1. Each section included an open-ended question inviting comment regarding the need for improving the specific aspect of training, and the areas in which this was seen to be necessary. Descriptive data analysis of the distribution of the median of aggregated scores was performed, and inferential statistics were used for comparison within groups. Respondents were arbitrarily divided into groups of time periods of qualification: before 1990, 1990 - 2000 and after 2000. The Kruskal-Wallis method was used to compare these groups' perceptions. There are 426 surgeons on the ASSA database. The target sample of 88 respondents (20.6%) for statistical validity was achieved. Eighty-eight per cent of respondents were male and 12% female. Fifty-nine per cent marked English as their first language, 32% Afrikaans and 8% various indigenous SA languages. There were respondents from all the medical schools in SA. The largest proportions were the University of Cape Town (25%), the University of the Witwatersrand (20%), Stellenbosch University (15%), the Nelson Mandela School of Medicine at the University of KwaZulu-Natal (10%) and the University of Pretoria (9%). All sectors of medical practice current in SA were represented (Table 1). The largest proportions of respondents were located in Gauteng (34%) and Limpopo (30%), with 11% or less in each of the other nine provinces. The Likert scores of the four items of enquiry are graphically represented in Figs 2 - 5. Respondents in general had positive perceptions of the acquisition of knowledge and surgical skill. There was nevertheless a perception of the need for subsequent knowledge acquisition (score 2.44, Fig. 2). 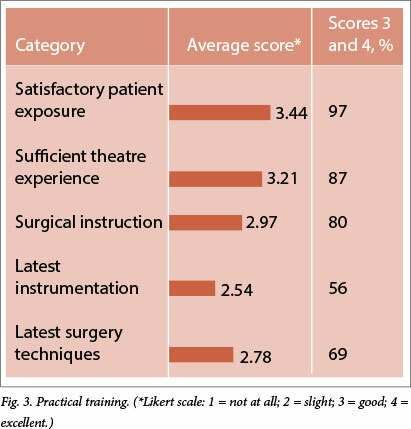 Only 56% of respondents were satisfied that the latest instrumentation had been available during their training (scores 3 and 4, Fig. 3). 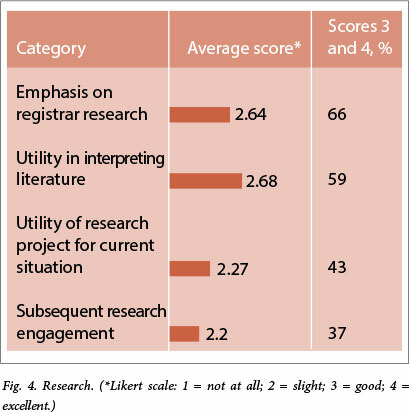 The respondents were less positive about research aspects, marking only average scores (Fig. 4). Although there was reasonable exposure to and utility of research, only 43% felt that their own research had been useful for their careers. Only 37% had engaged in any research after qualification. There was a negative perception of respondents' preparation for practice management during training (Fig. 5). Scores were very low for education in financial, legislation and practice administration aspects. Seventy-one per cent of respondents felt the need for such training. Only two comparisons of groups achieved statistical significance. These related to differences in perceptions of surgeons from different time periods of training. These are depicted in Table 3. 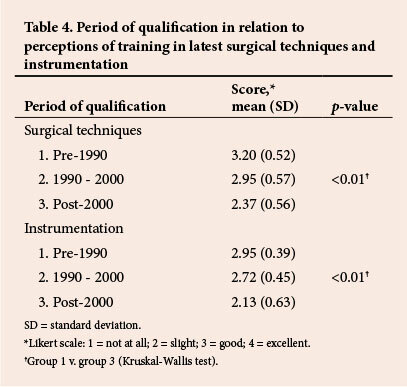 Surgeons who had qualified after 2000 were less positive about knowledge acquisition during their training than surgeons qualifying before 1990, scoring 3.25 v. 3.68 (p<0.05). A similar result was obtained regarding the applicability of knowledge gained to their practice, with scores of 3.03 v. 3.50 (p<0.05). The same two groups differed in their perception of exposure to the latest surgical techniques and instrumentation (Table 4). Younger surgeons felt that they had had less exposure, scoring 2.37 v. 3.20 (p<0.01) and 2.13 v. 2.95 (p<0.01), respectively. The open-ended questions revealed perceptions of certain deficiencies in the respondents' training (Table 5). It was felt that more education was needed in laparoscopic, oncological and vascular surgery (indicated by 12, 6 and 6, respectively, of 52 respondents). 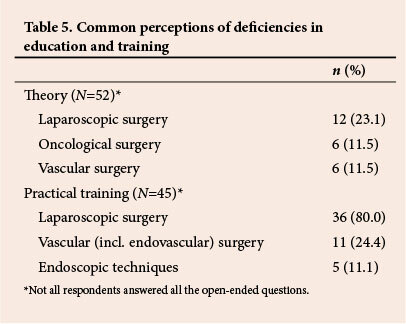 It was also felt that more practical training in laparoscopic and vascular (including endovascular) surgery and in endoscopic techniques was needed (indicated by 36, 11 and 5, respectively, of 45 respondents). The perception of greatest deficiency in training was therefore in laparoscopic (minimally invasive) surgery. While many surveys have been published of the perceptions of surgical trainees regarding their training, none have canvassed the attitudes of practising surgeons. Gabram et al. canvassed recently graduated surgeons, but addressed only their career concerns and not their training. Our unique survey addresses the surgeon's perceptions after having commenced a career in surgery. The perceived lack of training in business management was therefore not surprising. The survey furthermore reveals some changes in perceptions over time. The perception of deficient exposure to the latest surgical techniques and instrumentation among younger surgeons was not surprising, given the circumstances prevailing in the state health system in SA. The difference in the perception of knowledge acquisition and applicability between older and younger surgeons was, perhaps, less expected. Training in surgery in SA is based on the traditional First-World model as founded by William Halsted at Johns Hopkins University. Halsted adopted the German 'pyramid' system and introduced a well-defined structured training programme. The conventional surgery training programme is transactional in that knowledge and skills are imparted to registrars by faculty specialists, while caring for patients. Supervision is initially more intense, and responsibility is then gradually passed to the trainee. In SA this training occurs at state-run public hospitals that are associated with universities and accredited by the Health Professions Council of South Africa. Limited training takes place at private hospitals, usually by consultants who have appointments in academic departments. Concern has previously been expressed by the surgical fraternity regarding the maintenance of high standards of service, teaching and research in SA academic institutions. The dependence on state institutions has serious implications for the training of surgeons. Because of monetary constraints, public healthcare facilities are severely underresourced. This applies to staff, equipment and pharmaceuticals. Restrictions of patient care facilities have limited the exposure of trainees to opportunities to acquire skills. Perceptions of surgeons regarding laparoscopic training in SA have been surveyed previously. Lack of equipment was identified as a major hurdle to attaining laparoscopic proficiency. The significantly different perceptions in this study regarding knowledge acquisition, and training in the latest surgical techniques/instruments, as perceived by younger compared with older respondents, suggest a deterioration of these aspects over time. While this trend is based solely on perceptions, there is probably some substance bolstering these impressions. While a greater part of the health budget is justifiably channelled to primary and secondary health care, there is a danger of undermining the viability of the teaching hospitals. These are essential for the training of the professionals required to man the other tiers of medical services. While salaries for medical staff have improved substantially in recent years in SA, the problems in the public hospitals have made full-time academic practice unattractive. This has limited the recruitment of senior educators and the appointments of junior specialists. Posts for the latter are essential for practice-based learning, and for the development of a career in the public sector. These restrictions on training institutions seem to be reflected in this survey. While surgeons are satisfied with the acquisition of knowledge and skills, there are indications that training hospitals are under-equipped with regard to newer technology. This is indicated by the opinions on laparoscopic, endoscopic and endovascular procedures. The introduction of a research component by both the universities and the College of Surgeons into training programmes in SA is a recent development. The system is still in its infancy and was not viewed positively by respondents. While the emphasis on research was viewed reasonably positively, the required research project was not seen as useful for a surgical career. The emphasis on research in the SA curriculum is somewhat unique. (Performing research is not one of the core competencies stipulated by the Accreditation Council for Graduate Medical Education in the USA.) The system should probably be nurtured, but is not currently seen as useful by qualified surgeons, the required research project scoring only 2.27 in this survey and only 43% of surgeons responding positively. Training in practice management is not included anywhere in any guidelines for postgraduate surgery curricula. It is, however, important for surgeons who enter independent practice. This applies to most SA graduates, and the deficiency in such instruction is seen as a failure of the training. This attitude is abundantly clear in the study findings, perceptions regarding training required in finance, legislation and business management being extremely negative. A vast amount of knowledge of these aspects is required for starting an independent practice in SA. The lack of training in finance and practice management has been reported previously. Satiani surveyed 133 surgeons and reported that the average surgeon perceived him- or herself to be poorly equipped to understand basic financial principles. This deficiency apparently remains, almost universally, to be rectified. The question is, of course, whether such training is the task of the medical school. The American Surgical Association Blue Ribbon committee recognises changes in the nature of surgical practice and the need for changes in the training of surgeons. It emphasises the need for surgical research during training but makes only broad recommendations. The specific reservations regarding research that are expressed in the present study are not discussed. The need for training in financial and business management is not addressed. Responses in this survey from SA general surgeons regarding their training revealed positive perceptions regarding the acquisition of theory and technical skills. The mandatory research component for qualification was negatively perceived, and a different approach, such as more emphasis on translational clinical research, might be considered. There is a perception that the training centres are lagging behind in the acquisition of new technologies in surgery. Efforts are required to maintain these necessary areas of training in the academic institutions. The debate regarding private/public co-operation in surgical training should be re-opened, especially in light of the proposed National Health System for SA in which some form of amalgamation of the two systems is mooted.